Pandoorah Farm is a small organic farm located in Coolah, NSW that strives to offer high quality organically grown food at good prices. Pandoorah Farm were looking for an online presence that would allow their customers to place orders online. O'Connell Fencing is a local NSW Central Coast Fencing company that offers excellent service and high quality work. 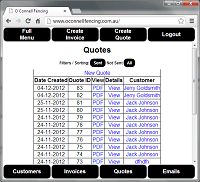 O'Connell Fencing were looking for a custom solution to replace the existing Invoice Management System that comprised of partially paper and a purchased software application. The Invoice Management System offers a complete customer solution from Quotes and Invoicing to Payments. Documents are emailed to Clients through the application, Clients are able to login to retrieve their documents and update their data. The web site offers potential fence types available, information about the company, and the ability to make an enquiry online.